This certification program contains 29 video courses. These videos contain the same information covered in our LIVE, online, 1-hour, instructor-led classes. You will also be able to download the training guide along with any class files that are used in the video course. Once you've completed all the lessons in all five series, you'll have a final test that also requires a passing score of 80% or higher. You will also need to submit a final project that tests your knowledge of the various topics covered in the Excel Certification program. 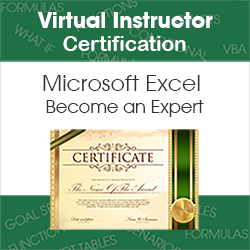 You'll need a passing score of 80% or higher on the project as well in order to receive your Virtual Instructor Excel Certification. This course demonstrates how to use the Advanced Filter command to copy filtered data to a new location on the worksheet. You'll learn how to use the Formula Auditing tools. In this Advanced Math Functions you'll learn to use the SumIfs, AverageIfs and CountIfs functions. These functions are similar to SumIF, AverageIf and CountIf that you learned in the Math Functions hour, but they have the ability to use multiple conditions. You'll also see examples of when to write formulas referencing combinations of Relative and Absolute cell references introduced in Sheets 301: Formula Essentials at the beginning of this 300 Series. During this hour, you'll learn the difference between storing a macro in the personal workbook versus storing a macro in a specific workbook. We'll also show you how to create a custom toolbar to store your macros.